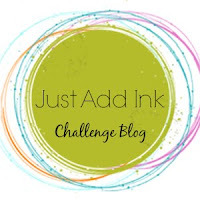 Just Add Ink #439..."Gift Box"
Happy Friday everyone and welcome to our last challenge at Just Add Ink for 2018! We have loved seeing all your projects for the different challenges throughout the year and we hope that you have been inspired as much as you inspire us! Thank you to everyone who has joined in and we hope that you all enjoy a safe and peaceful Christmas and look forward to seeing you back in 2019 with a fun Blog Hop on January 18. 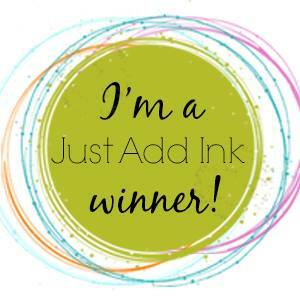 Well timed for Christmas, Patrice has asked us to Just Add A Gift Box for this challenge that will last for TWO WEEKS - closing on January 2nd. 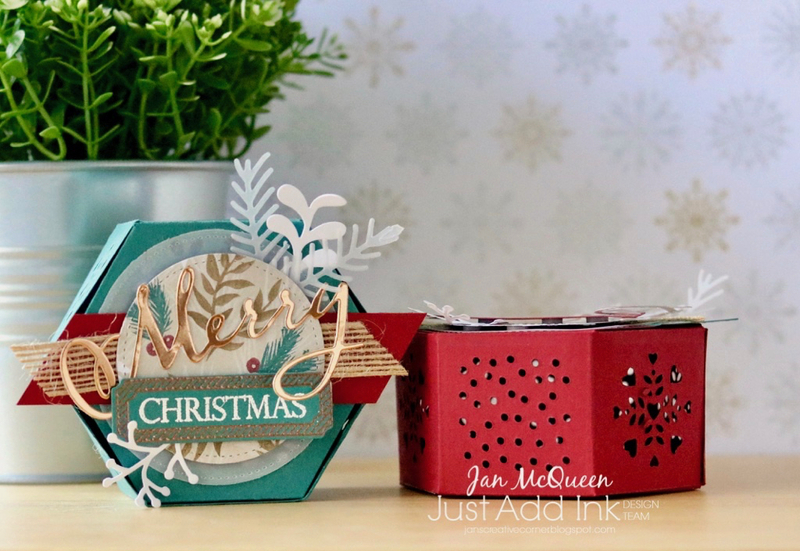 Whilst there won't be any voting by the design team we hope that you will enjoy sharing to inspire each other with all the different boxes you are creating for special gifts this Christmas season and beyond. 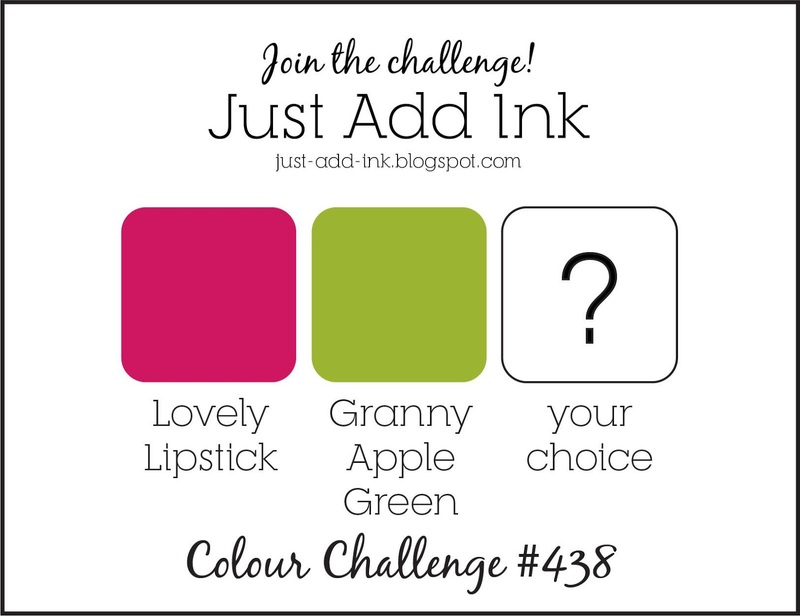 A big thank you to everyone who took the time in this busy Season to join us for last week's Colour challenge. 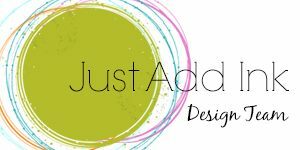 It was so lovely to pop over to your blogs and see the different third colour you chose to add and to see what themes were the focus in your lovely creations! 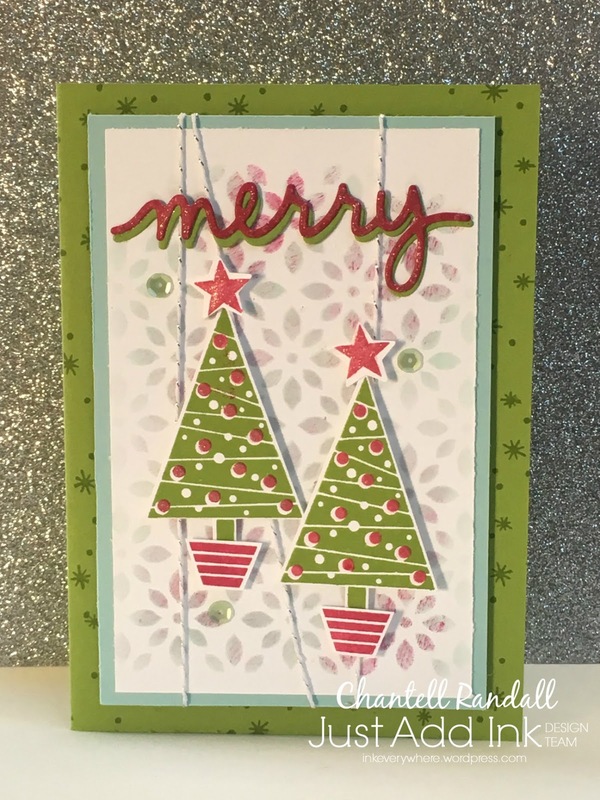 For this, the last Winners post of 2018, the Top Pick goes to Christine Dring for this bright and beautiful Christmas creation. Pretty ornaments and subtle sparkle. The colouring on these beautiful baubles gives a lovely 3D effect. 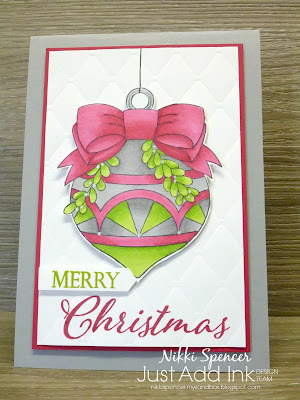 The prettiest baubles and a lovely light blue to complement the Challenge colours. 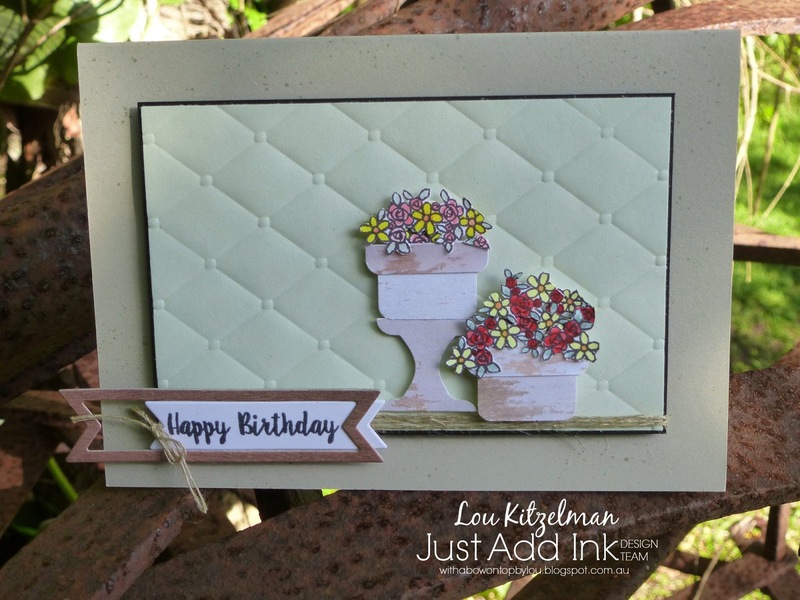 Lovely layers that create great texture. A gorgeous clean card with lovely textural elements. Stunning design and each element is perfectly placed. That koala is totally adorable especially paired up with all those hearts! 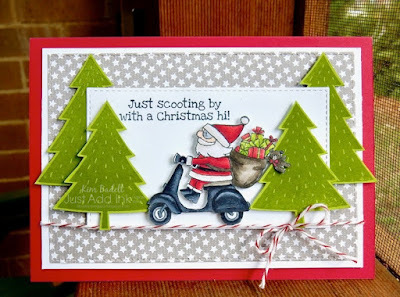 Super cute design and lovely balance of colour. Such an adorable and beautifully coloured and accented design! Hello and Happy Friday all! 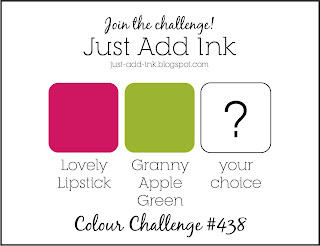 This week at Just Add Ink we have a fun colour challenge for you from Nikki. Nikki has selected the first two colours for you but you get to choose your third one! Here are the colours. Enjoy! 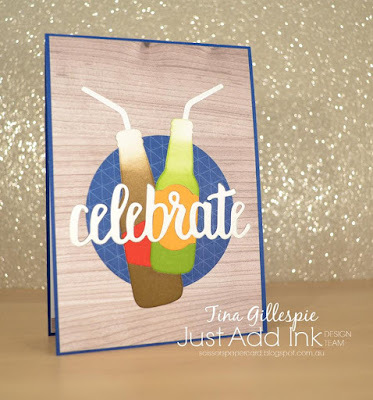 last weeks Just Add "I" challenge from Tina was one our trickier alphabet challenges so we were thrilled with all the lovely creative entries we got to look at. 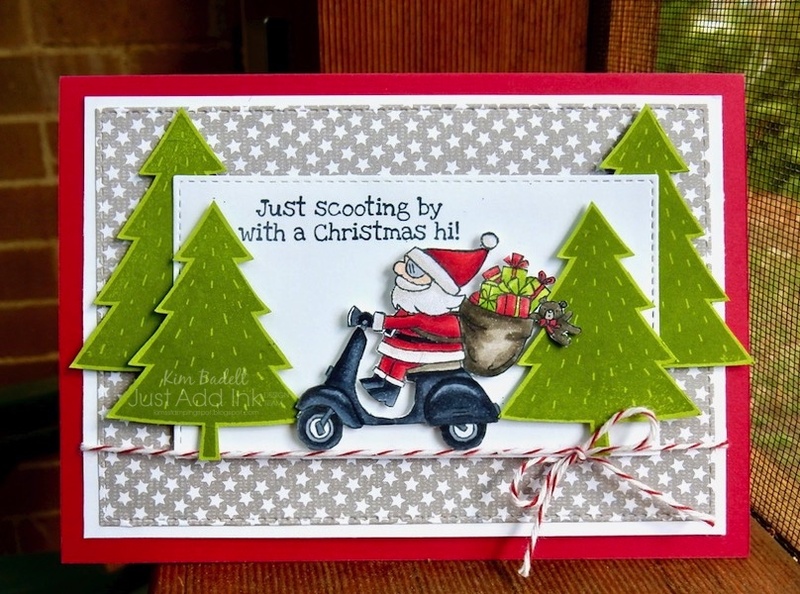 However, there can only be one winner and this week our winner is Birgit with this classic Christmas card. 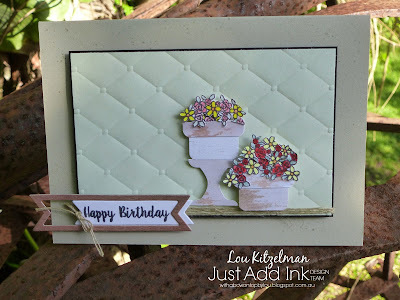 A really fun, textural and arty card. Such a fun, cute and beautifully detailed scene. 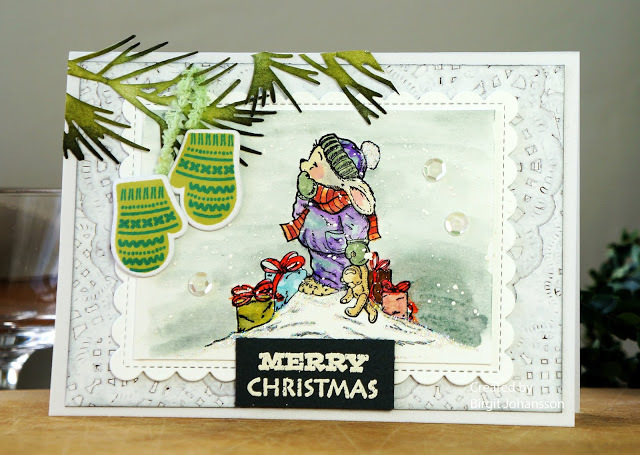 Delicate colouring brings such life to this sweet Christmas scene! Adorable Christmas card with the cutest little gnome! 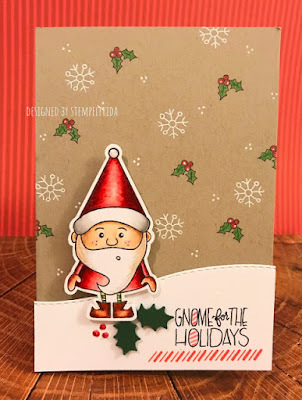 How can you resist that cute gnome Santa! Stunning colouring and a gorgeous, classic scene. Fabulous inking technique, creates a Wow background. 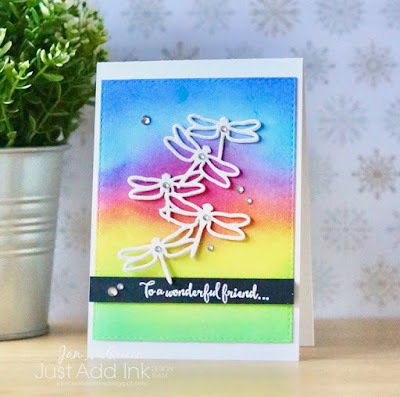 Beautiful rich inky background on her cute card. 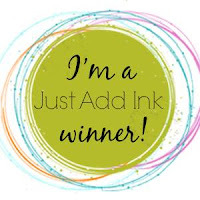 I just loved the intense inky background and the glittery snow. 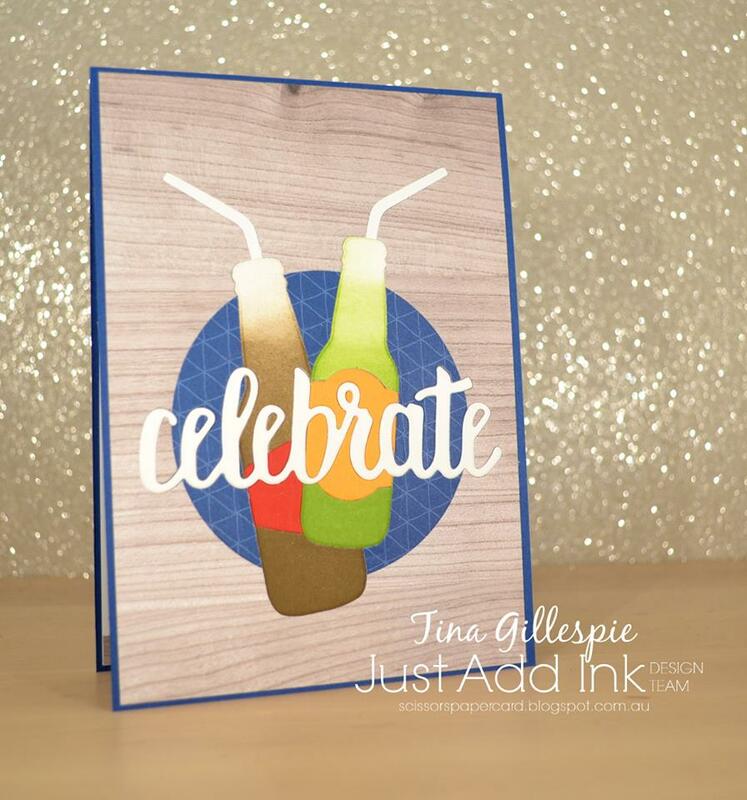 Just Add Ink #437...Just Add "I"
This week here at Just Add Ink, Tina has challenged us to add "I" to our projects! There are loads of options...Icing-Igloos-Islands-Ice-Inky techniques-Iridescent-Icicles-Icecream-Iris fold and the list goes on! 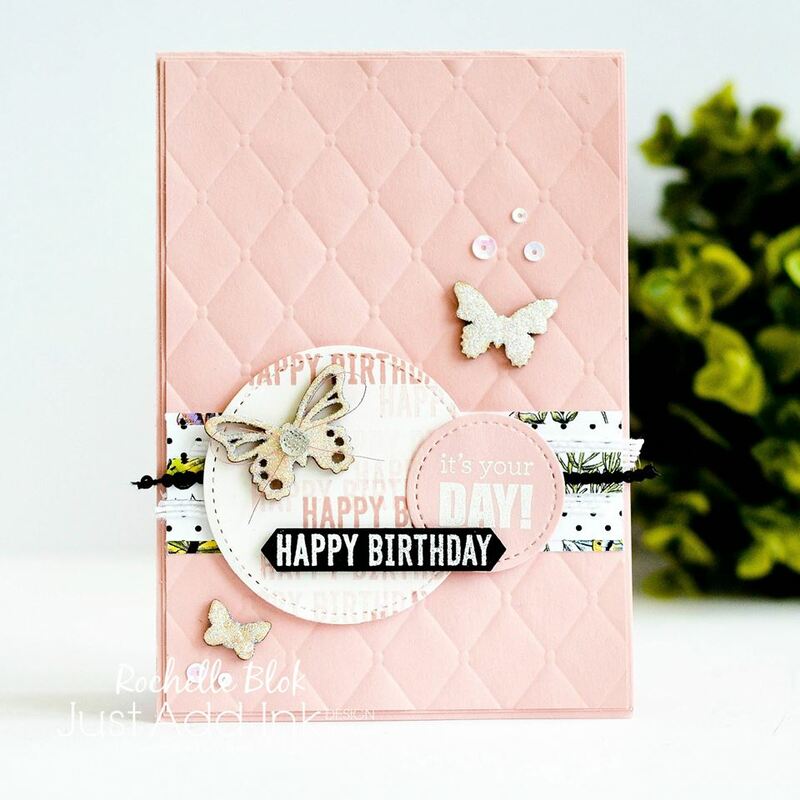 The design team have used some fun "I" elements on their projects to help you with even more ideas, so have fun and don't forget to tell us in your blog post exactly what your "I" element is. Thanks for joining in with this weeks "Sketch" challenge! 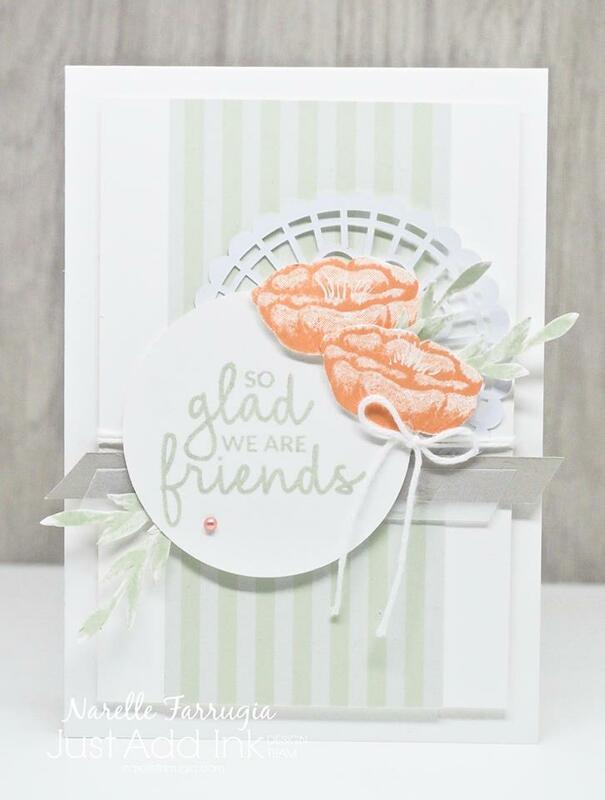 We had some lovely creative entries and enjoyed popping by your blogs to see how you incorporated the sketch elements into your projects...Thanks for joining us and we hope you will be back again soon for another fun Just Add Ink challenge! The design team votes have been tallied and our "Top Pick" for this week goes to Julie, with her fabulous black/white reindeer project. 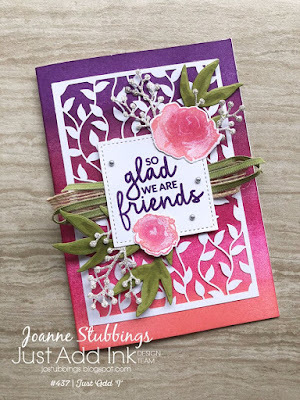 Lovely layers on this funky card. 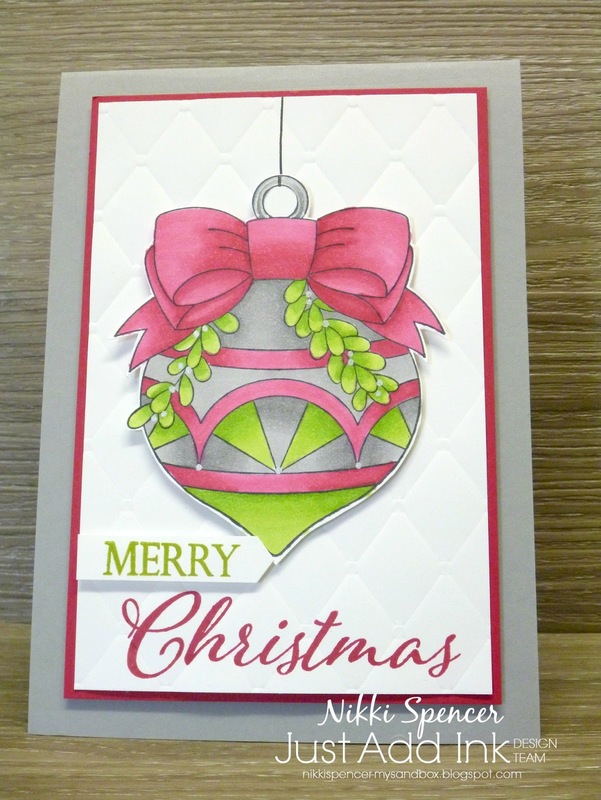 Fabulous mix of patterns and layers for fun Christmas card. A lovely use of non-traditional Christmas colours and papers. Beautiful use of the DSP layers. 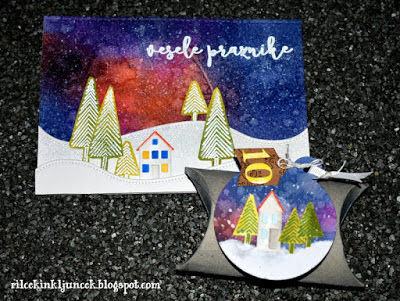 Love the use of the snowflake as the circle element. I love that she's used a snowflake for the circle element. Such a sweet Christmas card. 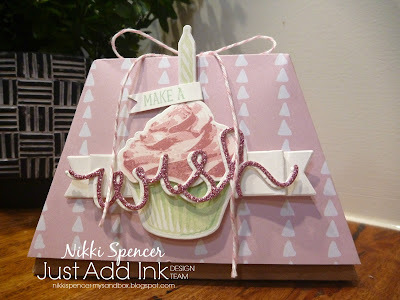 Such a sweet card! 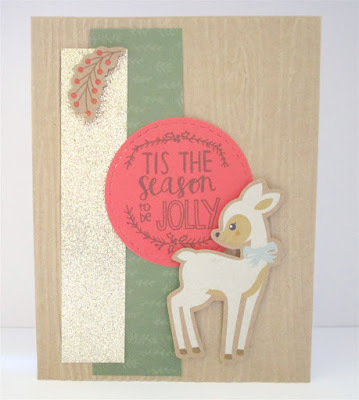 Love the use of soft colours, and a very cute reindeer! Totally adorable use of the sketch!